Salt therapy | What is it and how does it work for respiratory health? Traditionally administered in a “salt cave”, salt therapy (or Halotherapy) is the use of inhaled salt in minute quantities as a natural therapy of respiratory ailments. It has long been known that salt displays strong anti-inflammatory and anti-bacterial properties. 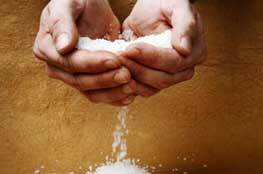 A supplemental benefit of salt therapy has been found to be significant improvement of many common skin complaints. 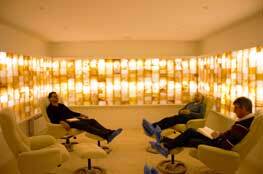 Salt Therapy (also known as ‘Halotherapy’) originated with the Greek and Romans many thousands of years ago. ‘Halotherapy’ derived from the Greek word halos, meaning ‘salt’, is a form of alternative medicine which makes use of salt. Numerous forms of salt therapy have been known of and used for millennia, usually taking place in a salt cave, which would have been a real cave or salt mine many years ago but has now more commonly been replaced by the modern suites that we see in salt therapy centres around the world today. In the 1840’s physicians in Poland and Russia noted that salt mine workers, far from suffering respiratory problems of typical mine workers, were fitter than the general population and rarely suffered any respiratory diseases or lung cancers. The Physician Felix Boczkowski was a key proponent of these findings. During bombing in World War II Karl Hermann Spannagel noticed that patients whom had used the Salt Mines as air raid shelters saw a remarkable improvement in their respiratory and dermatological health. There are now salt therapy centres using dry salt aerosol environments throughout Eastern and Western Europe and the USA. In the UK there are currently a small but steadily increasing number, with Little Himalaya being the very first salt cave to open in Warwickshire. 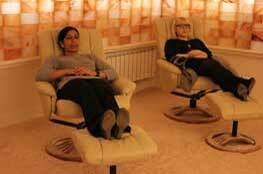 What does salt therapy at Little Himalaya involve? An appointment at Little Himalaya involves a 45 minute session relaxing in our purpose made ‘salt cave’, in an exceptionally relaxing atmosphere- no phones, no ipads. Find out exactly what is involved on our salt cave page. The very fine salt particles reach every part of the respiratory system, particularly the very fine alveoli of the lung. In healthy lungs the cilia (like tiny fingers) lift the mucus off the lung lining; with congested or diseased lungs the mucus has won the battle and will not easily shift. This mucus then becomes and ideal breeding bed for lurking bacteria. Kills resident bacteria with it’s anti-bacterial properties- stomachs have good bacteria; lungs should have no bacteria. Mucokinetic effect (helps lift mucus) using an Osmotic effect to thin and hence help lift mucus off the tissue linings. What’s so good about salt? Salt has the natural property of being able to absorb. As microscopic salt particles are inhaled- it is able to thin out and absorb the extra mucus- allowing a person to more easily release the mucus. Mucus is released through the nose, mouth and stool. The salt is able to reach the lower lobes of the lungs and the upper sinuses (where conventional medicine cannot) because of the size of the salt particles. The salt particles are between 3-5 microns. Salt is a natural antiseptic and natural anti inflammatory. The salt is able to kill germs in the respiratory system (which can cause the over production of mucus in many situations) and manage inflammation in the entire respiratory system. 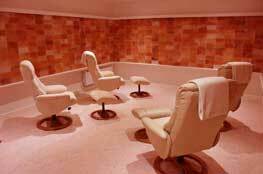 The salt used in our therapy rooms is naturally 99% sodium chloride. Sodium chloride has the property of being able to convert positive ions into negative ions. As an example, in one cubic centimetre of air outside of a salt room there is about 600-700 negative ions. In one cubic centimetre of air inside the salt room there are 3000-4000 negative ions. The room is allergen and microbe free. That is why, when the person is in the room they allow their immune system to rest and therefore strengthen. Himalayan salt blocks have throughout time been thought to produce an environment of negative ions by charging the air negatively. 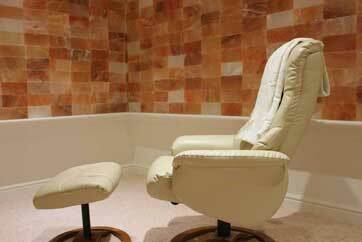 We believe we are the only salt therapy centre/ salt cave in the UK to feature genuine Himalayan Salt within the therapy room. Salt therapy is similar, but much more intense to spending time in the salty sea air, which offers many more benefits than just relaxation on the beach. Ancient healers and philosophers recommended salt inhalation for the respiratory system and health problems. Our salt cave offers the perfect place for this. 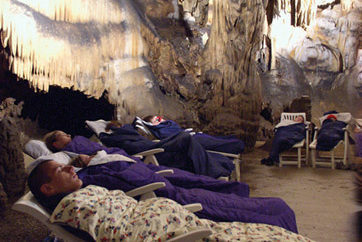 Dry salt therapy originates from speleotherapy (cave therapy) and the Wieliczka salt cave in Poland, where workers exhibited fewer respiratory illnesses. 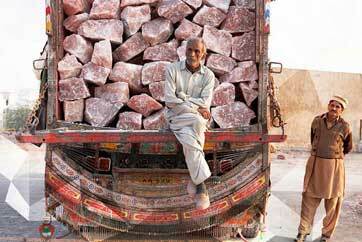 There are thousands of salt rooms in Europe and beyond. The benefits of salt therapy are wide-ranging. Salt is a vital ingredient of cell health; in its purest form it contains 84 elements and trace elements found in the human body. 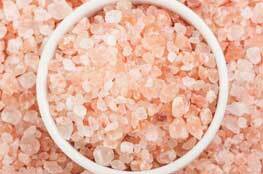 The negatively charged ions in Himalayan salt are thought to improve our health and mood. Inhaling particles may reduce inflammation and mucus in the lungs, improving respiratory conditions such as asthma, allergies, bronchitis, sinus congestion and Chronic Obstructive Pulmonary Disease (COPD). Scientific studies show that people with asthma and other ailments breath easier after using a salt cave for salt therapy. 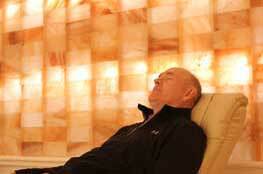 The calming and detoxifying effects of salt therapy can support the immune, nervous and lymphatic systems. Additional benefits are reduced stress and headaches, increased energy, and better sleep patterns. Salt ions purify the air and may increase lung capacity and reduce physical ailments for adults, children and athletes. Skin conditions can also be improved with salt therapy (psoriasis, rashes, eczema, acne). Pure mineral salts have natural moisturizing properties and support the skin’s water balance and barrier function by attracting moisture to the skin. Who might salt therapy help? It is thought that the minuscule size particles encourages cell repair in the derma and provides perfect Ph conditions to improve re-generation and skin rigidity. Salt therapy has been getting more and more attention in the media of late, with numerous articles and blogs reporting on this relatively new form of treatment. We’ve compiled a list of just some of these great articles here.